Store bought costumes are out of the question, so every year my daughter designs her own Halloween attire. That being the case, I feel compelled to also design costumes for her younger brother. This year was no exception. To make things a little easier (on myself) we stuck to what seemed to by “his” theme of costume illusions. 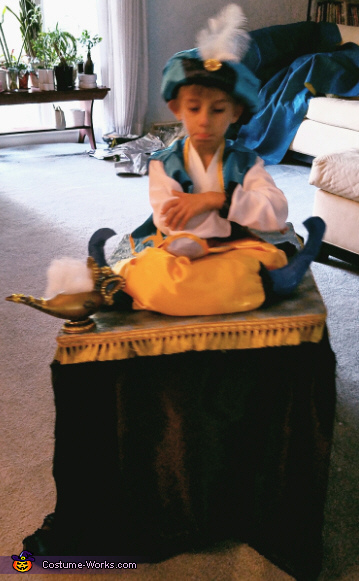 Making this Arabian prince on a flying carpet costume was relatively simple. The outfit was store bought with the exception of the shoes which were made from felt (needed to keep things lightweight). The fabric for the rug and to hide his legs was from a craft store along with the gold rug trimming. All of this was glued to a large cardboard base with a hole cutout for my son to fit. The challenging part came with figuring out how my son was going to carry this contraption. I first tried straps like a backpack, but since he is on the smaller side, it was still too heavy. After several unsuccessful attempts, I finally found one that worked. I ended up re-purposing the frame of an old filing cabinet on wheels and use this as sort of a “walker”. I attached the cardboard rug to the frame and all my son had to do was stand in the center and just “walk”. He loved the fact that he his costume had “wheels”. Everyone we ran into was amazed and most said it was the “coolest” costume they had ever seen.